So if you're a regular reader you'll know that I recently had some friends visit from Australia, Abu Dhabi and America. On this particular day, two of my friends were leaving so we got together for one last group dinner; the memo was to dress-up so being a vintage bunny of course meant I had to wear a swing dress and petticoat. This Hell Bunny dress is soooooooooooooo beautiful! You all know about my love affair with polka dots so I was instantly drawn in, and when you factor in the stunning cross-bust button design, the glorious collar (that is one seriously good collar), AND the circle dress roomy enough to accommodate a petticoat, I was literally in dress heaven. As you'll see from the group pictures to come later, the memo I didn't get was to wear dark colours, so I really stood out all day. The old me would never have bought this dress let alone worn it, but my growing confidence meant that not only did I wear it, but I wore it with complete pride and pretty much strutted throughout the day because I felt so good in it. It helps when you have the most amazing friends encouraging you and telling you you look great, but I felt it within myself too. Having said that, my arms were more on show than I have ever allowed and there were times when I put on my 'safety net' cardigan, briefly, until I felt at ease again. Why am I telling you this? Well, because my blog is honest. I will always be honest about how I wear my clothes and how confident/ comfortable I feel in said clothes. It's really important to me because this blog is documenting my journey, so if it's based on lies, what kind of journey am I taking?! I know I have more work in regards to my upper arm confidence, but most importantly, I'm not ashamed to admit that. 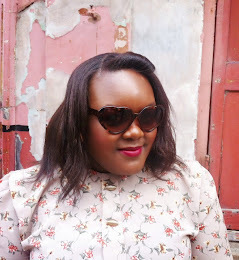 I felt really wonderful in this dress and the pink petticoat, adorable, bow sling-back flats, and retro style sunglasses made this the most perfect Summer outfit......OK, I'm putting it out there, this is my favourite outfit, ever (thus far)! I love this dress on you hun! The colour looks gorgeous against your skin tone!